(Nanowerk News) It doesn't happen often that a young scientist makes a significant and unexpected discovery, but postdoctoral researcher Stephen Wu of the U.S. Department of Energy's Argonne National Laboratory just did exactly that ("Paramagnetic Spin Seebeck Effect"). What he found--that you don't need a magnetic material to create spin current from insulators--has important implications for the field of spintronics and the development of high-speed, low-power electronics that use electron spin rather than charge to carry information. Wu's work upends prevailing ideas of how to generate a current of spins. "This is a discovery in the true sense," said Anand Bhattacharya, a physicist in Argonne's Materials Science Division and the Center for Nanoscale Materials (a DOE Office of Science user facility), who is the project's principal investigator. "There's no prediction of anything like it." Spin is a quantum property of electrons that scientists often compare to a tiny bar magnet that points either "up" or "down." Until now scientists and engineers have relied on shrinking electronics to make them faster, but now increasingly clever methods must be used to sustain the continued progression of electronics technology, as we reach the limit of how small we can create a transistor. One such method is to separate the flow of electron spin from the flow of electron current, upending the idea that information needs to be carried on wires and instead flowing it through insulators. To create a current of spins in insulators, scientists have typically kept electrons stationary in a lattice made of an insulating ferromagnetic material, such as yttrium iron garnet (YIG). When they apply a heat gradient across the material, the spins begin to "move"--that is, information about the orientation of a spin is communicated from one point to another along the lattice, much in the way a wave moves through water without actually transporting the water molecules anywhere. Spin excitations known as magnons are thought to carry the current. Wu set out to build on previous work with spin currents, expanding it to different materials using a new technique he'd developed. He worked on making devices a thousand times smaller than the typical systems used, giving him more control over the heat and allowing him to create larger thermal gradients in a smaller area. "That was the key to why we were able to do this experiment," he says. Wu looked at a layer of ferromagnetic YIG on a substrate of paramagnetic gadolinium gallium garnet (GGG). He expected to see no action from the GGG: in a paramagnet the spins aren't aligned as they are in a ferromagnet. They generate no magnetic field, produce no magnons, and there appears to be no way for the spins to communicate with one another. But to everyone's surprise, the spin current was stronger in the GGG than it was in the YIG. "The spins in the system were not talking to each other. But we still found measurable spin current," says Wu. "This effect shouldn't happen at all." The next step is to figure out why it does. "We don't know the way this works," said Bhattacharya. "There's an opportunity here for somebody to come up with a theory for this." The scientists also want to look for other materials that display this effect. "We think that there may be other new physics working here," said Bhattacharya. "Because, since the material is not a ferromagnet, the objects that are moving the spin are not what we typically understand." In the meantime, said Wu, "We've just taken ferromagnetism off its pedestal. 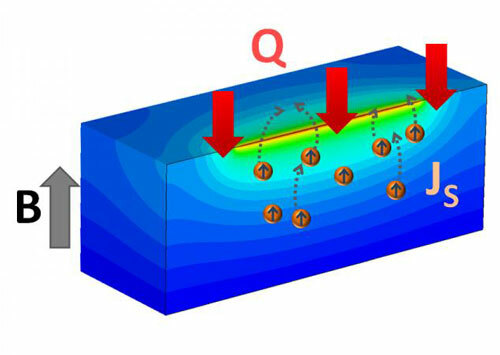 In a spintronic device you don't have to use a ferromagnet. You can use either a paramagnetic metal or a paramagnetic insulator to do it now."